As the only full-time resource devoted to disaster philanthropy, the Center for Disaster Philanthropy partnered with Foundation Center in 2014 to track philanthropic funding flows to disasters. Measuring the State of Disaster Philanthropy is the first effort to establish baseline data, aggregate multiple data streams, and track disaster giving. By increasing the information available on disaster giving, philanthropists, government agencies, and NGOs, we will be better able to coordinate and make more strategic decisions, ultimately resulting in more effective disaster philanthropy and assistance. The project’s work is guided by an expert advisory committee and consultation with key stakeholders. We look forward to broad participation and collaboration across the disaster philanthropy field, and together, to creating useful and relevant tools to assist in donor and grantee decision making, transparency, and coordination. Through Measuring the State of Disaster Philanthropy, donors, NGOs, government, media, and more will now know exactly how much money is spent on which disasters each year, by whom, and for what activities. This project is generously supported by the Irene W. and C.B. Pennington Foundation and the Conrad N. Hilton Foundation. In this taxonomy, types of disasters fall into four broad buckets: natural disasters, man-made accidents, complex humanitarian emergencies, and disasters-general (funding for unspecified disasters or multiple, disparate disasters). 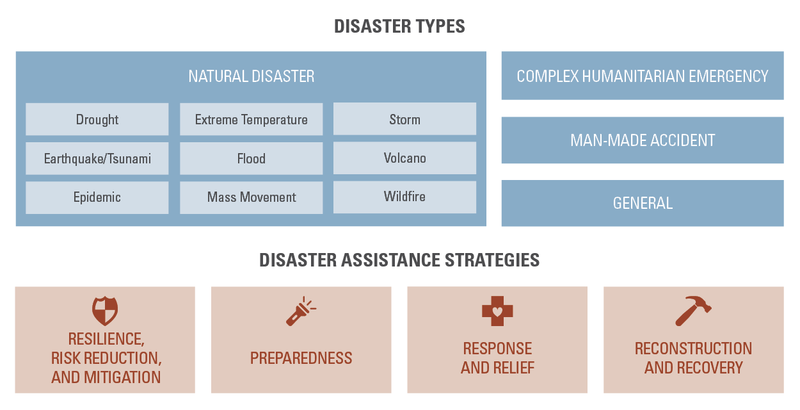 The taxonomy related to disaster assistance strategies lifts up the disaster life cycle, highlighting points of intervention before, during, and after disasters. Although much attention is focused on communities in the immediate aftermath of disasters, there is growing recognition that more attention needs to be paid to resilience, mitigation, and preparedness efforts that help minimize the economic, social, and human consequences of disaster. Likewise the disaster life cycle lifts up the importance of investing in longer-term recovery efforts to ensure that communities re-build with an eye toward being able to withstand the impact of disasters more fully. This project examines giving from foundation, government, and corporate donors, in addition to funds raised through online platforms, to provide an emerging picture of disaster-related philanthropy. Beyond foundations, data sources were chosen because they were publicly available. In the future, we hope to partner with other organizations to capture additional funding data. The dashboard includes data from the following sources. More detailed information is available on the respective Giving Data pages. Aggregated data on contributions made by corporations, based on CECP’s Giving in Numbers report.